You are here: Home » MEDIA » Books » The Doomed City (SF Masterworks) by Arkady & Boris Strugatsky (book review). 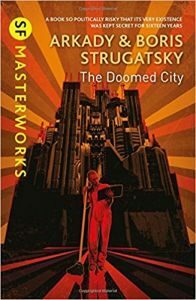 The Doomed City (SF Masterworks) by Arkady & Boris Strugatsky (book review). A large city with farms on at least one of its borders and swamps on another is just about self-sustaining itself. It appears to have existed before populated by people from various nationalities and religions and, from the looks of things, from different time periods. New people, like Selma, suddenly arrive. Elusive Mentors supervise and advise but tend to keep out of the way of the normal way of life of politics and the black market of goods. Communities grow but they are all part of some Experiment which even they have no idea what is going on. Any metaphors to Russia at the time is more than coincidental. Garbage collector Andrei Voronin is having a party in his flat with hospitality Russian-style, hearing the news baboons arriving in the city, although doesn’t really affect them. The word has spread out that these primates will be captured and catalogued and dispersed to the people to look after. This opening section is largely to present the world or rather city they live in with the odd moments of happiness amongst the despair that they should be feeling. Russian brothers Arkady and Boris Strugatsky present a descriptive character-driven presentation into their ‘The Doomed City’ prepping you for what is to come. In the second section, nine months later, Voronin is now a police detective and in search of a building that moves around the city, drawing in people, never to be seen again. Along the way, there are other discoveries and how people are routinely moved to other jobs, although not really shown if they are qualified or, with one character, Wang, not wanting to do it and facing time in the swamps if he doesn’t. The next section has Voronin as editor of the City Gazette and thrust into the centre of a revolution. By this stage, you do start to wonder at the Strugatskys’ sub-text. One of the flairs of their ability was to create three-dimensional characters. With ‘The Doomed City’, by recurring the same characters in different roles, you see how they adapt to their situations. Voronin is doing well by the fourth and fifth sections, he is a city counsellor and ordered to take a team to seek the anticity and find out what is going wrong with the Experiment. It is mostly solitary and despair is setting in amongst the team and their supplies are running out. I felt the ending was a little murky and not as strong as the rest of the book. Boris Strugatsky in an afterward explains how he and his brother started writing the book in 1967 and finished it in 1972. Living in Russia, they were aware how subversive their works were considered and it wasn’t in print until 1988-89, in two books although word of it was literally given to a small number of friends by them reciting it. I should point out that this book is a dense print so their readings must have been spread over weeks. If any of this reminds you of the film, ‘Dark City’ (1998), bear in mind this book was written in 1972 but wasn’t in print until 1989 just in case the Russian government came down on any anti-Soviet sub-text. I have vague memories of a building moving around a city being used elsewhere as well but can’t place where at the time of writing. Oddly, I’m not sure if any of the characters communism ways came out in the fiction but that maybe because I haven’t seen much of it myself to understand the difference. All fiction adapts to your own mindset. The way they socialise definitely fulfils the image of how you would think Russians entertain and talk. I’ve read a few of the Strugatsky brothers SF in the past and if you’ve never experienced them before, then this book will give you an opportunity to read them now. If nothing else, it shows that even in oppressive societies, Science Fiction will rear its head for observational comment. « Down Among The Sticks And Bones (book 2) by Seanan McGuire (book review).